Quick, name a cocktail made with tequila. The Margarita, you say? Yeah, everybody knows that one. And maybe The Tequila Sunrise. But after that . . . ? Well, meet the Rosita Cocktail: A colorful tequila-powered sipper that’s overflowing with flavor. The Rosita is delicious enough all by itself. But because we’re publishing on April 1st this year, we’re giving you a second cocktail, as a special bonus. It’s the perfect drink for April Fool’s Day. You won’t want to miss it, so read on. The Rosita combines tequila with Campari, sweet vermouth, and dry vermouth (plus a dash of Angostura bitters). 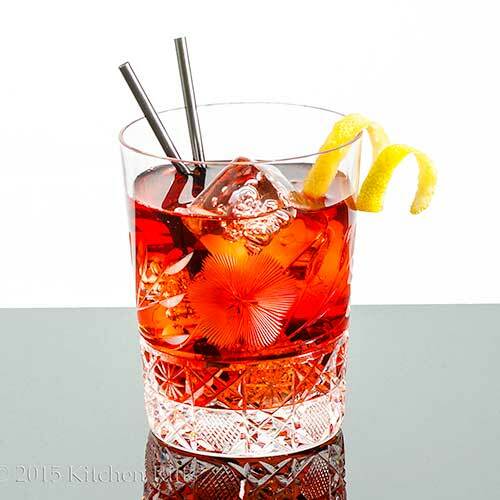 In appearance and taste profile, it resembles the Negroni Cocktail (which, in case you’ve forgotten, consists of Campari, sweet vermouth, and gin). We learned about The Rosita from Robert Hess. The history of this drink is a bit confused, but it was probably popularized by Gary Regan. More in the Notes. You can serve this drink over ice in a rocks (Old-Fashioned) glass or “up” in a cocktail glass. The recipe takes about 5 minutes to prepare, and serves 1. Place all ingredients (except garnish) in a mixing glass that is half-filled with ice. Stir briskly. Strain either into an ice-filled rocks glass or into a cocktail glass (preferably one that’s been chilled). Garnish, if you wish, with a lemon twist. Serve and enjoy. If you’re serving this drink in a rocks glass, you don’t actually need to use a mixing glass. Instead, you can simply pour the ingredients into the ice-filled rocks glass and give them a quick stir to combine. Then garnish with a twist, of course. 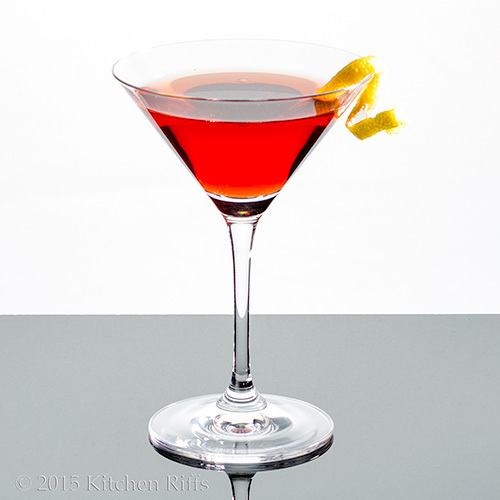 Gary Regan likes to make this drink with a full ounce of Campari (instead of half an ounce). We think the drink tastes too “hot” that way, but you may prefer it. Tequila has become increasingly popular in recent years—though not so much in cocktails. Instead, a lot of today’s action involves sipping fine reposado or añejo tequilas. When it comes to cocktails, we like to use a silver (also known as blanco) tequila, preferably one made with 100% agave. Silver tequila tends to be less smooth than reposado or añejo, but the rougher taste makes it perfect for mixed drinks, in our opinion. Your taste may vary. What brand to use? We like Jose Cuervo Tradicional, which you can find in just about any liquor store. Lately, we’ve also been using the Tres Agaves brand—and it has become a real favorite. Reminder: We’re noncommercial and are not compensated for recommending brands. We suggest what we like (and buy with our own money). Campari is a red-hued Italian liqueur with bitter flavor. Some people enjoy it over ice or with soda water before dinner. We tend to prefer using it as a cocktail ingredient. 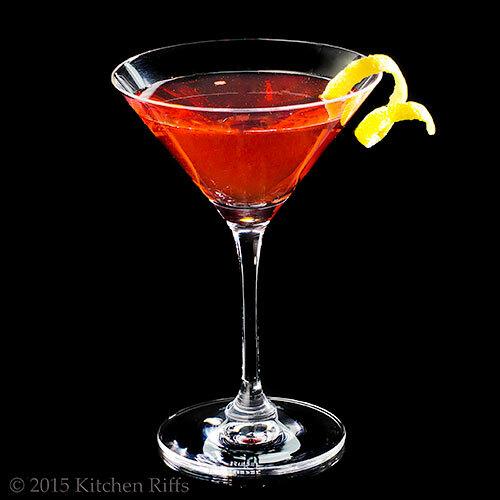 Like Campari, vermouth can also be consumed as an apéritif. The sweet (red) variety is often associated with Italy, while the dry (white or clear) kind is associated with France. Martini & Rossi makes both sweet and dry vermouths, and both are good. We also like Noilly Prat for dry vermouth. BTW, vermouth is a fortified wine with a fairly low alcohol content. Which means an open bottle will eventually oxidize, losing considerable quality in the process. We always store opened bottles of vermouth in the refrigerator, which greatly retards the oxidization process. As is the case with many cocktails, the origins of this one are obscure. As noted above, we discovered it in a video by Robert Hess, who says he found it in a GQ magazine article by Terry Sullivan. When Hess asked Sullivan how he knew about it, Sullivan couldn’t immediately remember. He eventually determined that he had seen it in Gary Regan’s book, The Bartender’s Bible. Regan had totally forgotten about the drink, however. In fact, he thought he had learned about it from Sullivan! Ultimately, it turned out that Regan had found the drink in the 1988 edition of Mr. Boston: Official Bartender’s Guide, which he had used while researching his Bible. But who knows where Mr. Boston found it? Regan changed the drink slightly, adding more tequila, along with Angostura bitters. The Rosita Cocktail would be a wonderful drink for Cinco de Mayo (especially if you’re looking for an alternative to the tried-and-true Margarita). It also makes an excellent before-dinner drink during the warm-weather months. Searching for other cocktails that contain tequila? Well, some possibilities include the Paloma, the Diablo, the Frostbite, and the Prado. Eventually, we’ll get to all of them. “Is it a difficult drink to make?” asked Mrs K R.
You had me at Campari! Thanks for introducing me to another Campari cocktail to enjoy. oh.... what a lovely cocktail! I wish I could try it! Looks so delicious! Hi Pamela, isn't Campari wonderful stuff? Lovely in this drink. ;-) Thanks for the comment. Hi Marcela, it's a great drink! Definitely worth trying if you ever get the chance. Thanks for the comment. What a delicious sounding recipe. I will definitely be giving this one a try. As for the Croton, I have been drinking a local variation of that my whole life and didn't know it LOL! Campari is the next on my list to try good stuff. Your drinks looks outlandishly beautiful John. Hi Karen, this is a fun drink. Well, both of them, actually, but especially the Rosita. ;-) Thanks for the comment. Hi Minnie, Campari really has a wonderful flavor. Try it in a Negroni -- the best way to use it, IMO. Although it's awfully nice in the Rosita, too! Thanks for the comment. What a gorgeous ruby color this drink is! I also prefer cocktails made with a Blanco Tequila and we seem to like the same brand too - Jose Cuervo is my fav brand for tequila. What a gorgeous looking drink. Like a sunset rose! Hi John , beautiful cocktail as usual , I enjoy a great cocktail like everyone else , just in moderation , being a diabetic don't make me miss out on the good things in life . You can over indulged in anything . The Croton Cocktail - ha ha. Good one John! Tequilla sure has come a long way since the 70's. Martinis, tequilla sunrise, and shots with lime and salt have been my experience. Sipping fine tequilla? Haven't gone there yet. However, I do like the idea of these cocktails, especially this one because it's so very pretty. Need to look up Campari liquor. I don't remember it. Thanks for another great cocktail! Beautiful color and beautiful name ( one of my best friends is calles Rosita) and I'm sure it tastes divine too. Happy Easter and cheers with a Rosita Cocktail! Hi Dottie, since you don't really drink much, the Croton Cocktail is perfect for you. :-) Thanks for the comment. Hi Shashi, isn't this pretty? Love its looks! Thanks for the comment. Hi Rocquie, even if one doesn't drink, it's fun to look at cocktails! They're so pretty! Thanks for the comment. Hi Ansh, Jose Cuevo isn't fancy, but they make a good tequila. And I love the way this drink looks! Thanks for the comment. Hi Nee, the best way to drink in moderation is for every one of these, indulge in 2 or 3 Croton Cocktails. ;-) Thanks for the comment. Hi Denise, isn't this a nice drink? Happy Easter, and thanks for the comment. Hi MJ, I usually don't sip tequila, but there are some out there that are smooth and nice when taken neat. Campari is wonderful stuff, although an acquired taste for some. Worth checking, out, IMO. Thanks for the comment. Hi Daniela, agree both the name and the color are wonderful! Happy Easter, and thanks for the comment. I really need to try this - not only does it sound refreshing but it is gorgeous! After a day of doing our taxes I think I at least deserve a bourbon. Happy April 1st! Hi Tricia, if you just did your taxes, your probably need something with alcohol in it. Plus something that contains chocolate. ;-) Thanks for the comment. Hi Greg, sure, it was all the Margarita's fault. The tequila was just along for the ride. :D The Campari really sounds out in this drink, so you'll like it. Thanks for the comment. That looks way more sophisticated than any ol' margarita. I like the touch of bitters, too. Definitely a cocktail I will savor. Hi Carolyn, this sure tastes different than a margarita! But they're both good. ;-) Thanks for the comment. I need Rosita NOW! We are big tequila drinkers and have all those ingredients on hand. YES! So now I've finished cleaning the house and I'm off on my first airport run. I'd much rather be having one of these! I am rolling my Rs, can you hear me when I say Rrrrrosita! I think I need one of these tonight to start off the long weekend. Australia shuts down from Thursday night til Tuesday morning. It is a gorgeous drink! Thanks for sharing! Hi Abbe, after all your airport runs enjoy one. Or more. :-) Thanks for the comment. Hi Juliana, we prefer it on the rocks, too! Weird, because we like a Negroni "up." But the tequila has a bit more oomph, which the rocks help tame. Thanks for the comment. Hi Maureen, have a wonderful long weekend! And several of these. Rolled Rs and all. :-) Thanks for the comment. Hi Peachy, isn't this pretty? Tastes good, too, which is the important thing! Thanks for the comment. It sounds tasty and looks pretty! Hi Pam, it's a nice drink -- loads of flavor. And I love the way it looks! Thanks for the comment. Can you believe I've never ever had tequila? I need to change that with this drink, much less caloric than a margarita too. Another sophistcated cocktail. You make me want to start drinking regularly by posting all these beautiful drink! Excellent! I drink Croton Highballs every day of my life! Wow----this is similar to the Negroni all right. Fun. Of course the post is as polished and interesting as one as comes to expect from you. Hi Laura, you're right that this is less caloric than a margarita, particularly the huge ones that some places serve! Thanks for the comment. Hi Julia, most of the time I post only 1 cocktail a month (there are exceptions, though, like in the summer), so your regular habit shouldn't be too bad. :D Thanks for the comment. Hi Beth, yup, I'm a big fan of the Croton Highball too! Thanks for the comment. Hi Carol, it really is close to the Negroni, although with the flavor of the tequila. Thanks for the comment. I love finding new cocktails to make that use tequila - it's a favorite of mine! Hi Lux, it really is! :-D Thanks for the comment. Hi Ashley, there aren't that many really good tequila cocktails, are there? But this is one of them! Thanks for the comment. Beautiful and anything with tequila is a winner for me! There's a serious amount of booze in this cocktail! Sounds good though! This is a perfect addition to warm cold nights now that winter is coming!! Thank you, John! Hi Alyssa, tequila has such an interesting flavor, doesn't it? And it works well with the Campari. Thanks for the comment. Hi Charlie, NY is a wonderful place and we love to visit. But glad we don't live there now--it's so expensive and frenetic. Loved our time there, however. Thanks for the comment. Hi Carolilne, a lot of booze indeed! Although much of it is pretty low proof. ;-) Thanks for the comment. Hi Julie & Alesah, you make a good point -- although I like this as a warm weather drink, it's actually a bit warming, so it's really good in cooler weather too. Perfect fall drink. :-) Thanks for the comment. HI Debra, yup, I've acquired it too! Really good stuff. ;-) Thanks for the comment. These drinks look gorgeous and like they could really fancy up a party! Hi Pamela, isn't this pretty? Tasty, too. ;-) Thanks for the comment. will you share how tou arranged the photo shoots my friend ??? Hi Dedy, for the photos, you really want to read Light, Science, and Magic. Specifically the part on dark field and light field photos (or whatever they call it – I’m going from memory here). These photos are all lit with 2 lights. On the black background photos (and this is easier to see with the cocktail glass ones), the photos are backlit, but with a black card behind them to block the light. But the edges of the background light illuminate the edges of the glass (you can see this in the stem in particular), lighting them and defining them from the black background. Then there’s a 2nd light, also from behind, but a bit to the side, that lights the drink itself. White bounce cards help light the front of the drink. On the white background ones (again, the cocktail glass provides the example that’s easier to see), the background light provides most of the illumination. Here I have black cards on each side of the glass (just outside of the view of the camera) to help define the shape of the glass (see how the stem is outlined in black? That’s the reflection of the black cards.). A 2nd light helps provide additional light, and again white reflection cards light the front of the drink. All photos are on black acrylic – in the case of the light ones, it’s the reflection of the background light that’s making the acrylic seem grey. You really want to read that book – it tells you everything you need to know to light anything. Thanks for the comment. After that introduction I was keen to see what was in the drink. It must be very powerful though it certainly looks beautiful. Hi Suzanne, the drink is a bit on the strong side -- a lot of ingredients, although some of them are rather low-proof. Thanks for the comment. Thanks for the reminder to store my vermouth in the fridge---I pulled it out recently due to lack of space, but I think I'll squeeze it back in :) Nice cocktail---the color is gorgeous! Happy Easter to you and Mrs. K. R.! Hi Liz, we lack space in our refrigerator, too. How do those things fill up so?! But we always find room for vermouth and sherry -- we don't use them all that often, so they'd lose quality if we didn't refrigerate them. Happy Easter, and thanks for the comment! Indeed, one gorgeous looking drink John. I most certainly wouldn't mind a sip about now:) A very Happy Easter to You and Mrs. K.R! Hi Louise, Happy Easter to you and Marion! And thanks for the comment. My husband's coworker gives him bottles of tequila all the time. It'll be nice to have an alternative to the typical margarita. Hi Kristi, margaritas are nice, but it's nice to have a variety of drinks to choose from, isn't it? ;-) Thanks for the comment. We left the cocktail wagon years ago while raising kids (easier to pour wine and/or beer). We recently discovered Manhattan's for a TGIF drink and are branching out. This is so pretty - will have to try it. Hi Claudia, the Manhattan is a wonderful cocktail! One of my favorites. This isn't as good (IMO), but it's awfully nice. And its color is gorgeous! Thanks for the comment. Hi John, never knew there were so many types of cocktails available, love the stories behind them. I love the color of this drink! To be honest I don't think I have ever heard of this Rosita Cocktail. If if it taste as good as it looks it must be very tasty. Hi Raymund, this isn't that well known of a drink. But it should be! ;-) Thanks for the comment. Hi Cheri, isn't it interesting how many different drinks are out there? Makes research fun! ;-) Thanks for the comment. Hi Dawn, isn't this a gorgeous drink? And it really does taste as good as it looks! Thanks for the comment. Negronis are one of my favorite cocktails, and the color of this one is glorious! Hi Sue, the Negroni is a real favorite of ours, too. This is a nice variation on that drink. :-) Thanks for the comment. all i can say it's all worth the effort!!!!! Hi Dedy, thanks so much! As always, your cocktails look so tempting and tasty! I love reading about all the different drinks that I have never heard of before. Hi Amy, isn't this a fun drink? And tempting & tasty is exactly the way I'd describe it. :-) Thanks for the comment. Hi Kumar, it's a really great tasting drink. Pretty, too. :-) Thanks for the comment. Hi Dana, isn't this nice? And I just love the color! Thanks for the comment. Hi Adri, it's really such a nice drink! Tasty and really pretty -- our favorite combo. ;-) Thanks for the comment. This is brilliant! I LOVE negronis and boulevardiers but have never thought of using tequila. I'll be trying this pronto!! 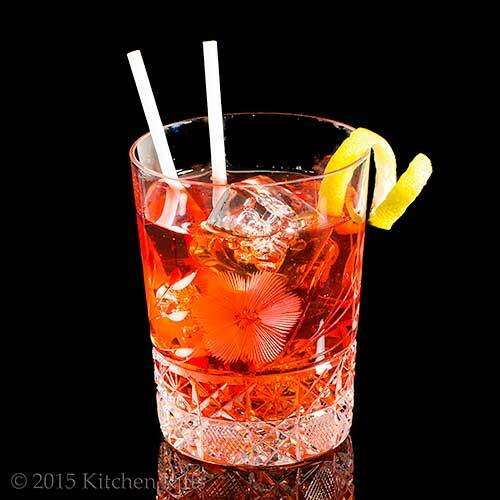 Hi Kristen, nothing compares with a Negroni IMO, but this is a really fun variation! Definitely worth a try. ;-) Thanks for the comment.